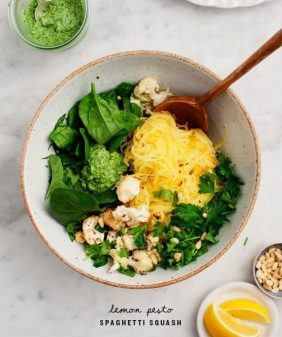 Spaghetti squash is such a fun, underrated vegetable! Here is my favorite way to cook it, along with a few tips and recipes. 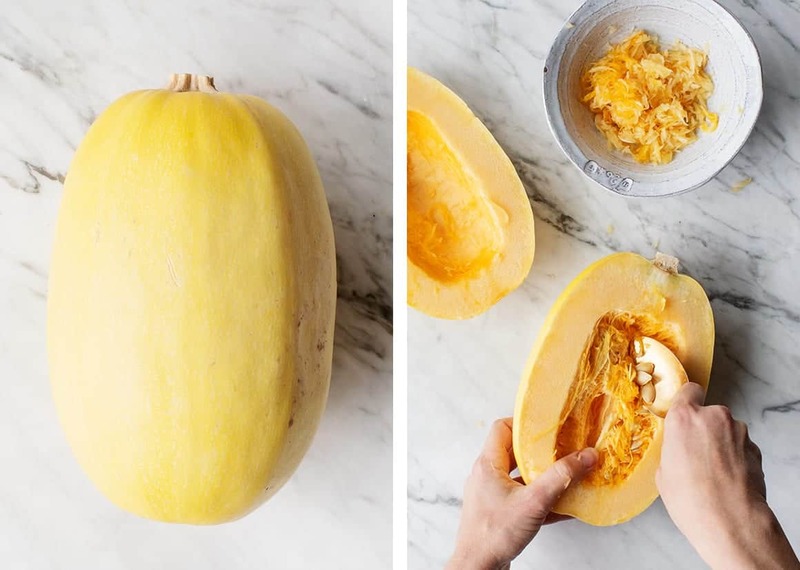 I get so many questions about how to cook spaghetti squash, so I thought I’d share my go-to method for roasting it, a few tips, and a couple of my favorite spaghetti squash recipes. First things first: cut it in half lengthwise. Then, scoop out the seeds and roast it. Next, drizzle the insides lightly with olive oil and sprinkle with salt and pepper. I find that adding too much oil and too much salt at this stage makes the squash a bit watery, so a light drizzle and a light sprinkle will do. Then, poke a few holes in the skin of the squash with a fork and place it cut side down on a baking sheet. Pop it in a pre-heated 400°F oven. A mistake I used to make was roasting my squash too long. I used to roast it for an hour or longer, but now I roast it for 30 to 40 minutes. I initially thought the squash needed to be super soft and fork tender in order for the strands to “spaghetti,” but over the years I’ve learned that I prefer my strands to be more al dente (and less mushy), and that the 1 hour mark was too long. Of course, the timing will entirely depend on the size of your squash and the heat of your particular oven. It can also vary from squash to squash, so adjust your cooking time accordingly. Once it’s roasted and cool enough to touch, use a fork to scrape the strands. I like to start from the outside and work my way in, fluffing them up as I go. That’s it! Season it with more salt and pepper and serve it as a simple veggie side. Or incorporate it into your favorite spaghetti squash recipes. 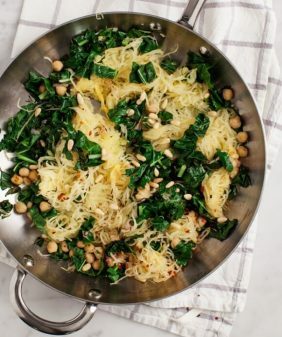 Here are two of mine (pictured below): Spaghetti Squash with Chickpeas and Kale and Lemon Pesto Spaghetti Squash. This is my go-to method for creating perfect al dente spaghetti squash strands to use in vegetable sides and main dishes. The exact timing will vary depending on the heat of your oven and the size of your squash. Slice the spaghetti squash in half lengthwise and scoop out the seeds and ribbing. Drizzle the inside of the squash with olive oil and sprinkle with salt and pepper. Place the spaghetti squash cut side down on the baking sheet and use a fork to poke holes. Roast for 30 to 40 minutes or until lightly browned on the outside, fork tender, but still a litte bit firm. The time will vary depending on the size of your squash. I also find that the timing can vary from squash to squash. Remove from the oven and flip the squash so that it’s cut side up. When cool to the touch, use a fork to scrape and fluff the strands from the sides of the squash. Hi! Happy Tuesday! 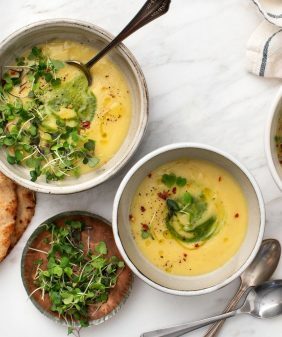 Do you know if this would work with any butternut squash? It’s the softest squash I can find in Spain unfortunately. during autumn and winter I always have a big batch of roasted squash ready in the fridge to add to all sort of dishes, however it has never occured to me to try to make spaghetti with it! Was just curious to know if someone has already made the test! You can check for each specific city on google perhaps squash is not in high demand. Try going to Pappadeaux next time you’re in the States… Georgia and Texas for sure. They have a spaghetti squash with pesto sauce on it to die for! You’ll love it. I topped mine with stewed chicken two days ago, and I’m having it again with chicken and broccoli, in a garlic alfredo sauce. Thanks for introducing me to a new veggie! I agree with roasting rather than steaming if you want to use your spaghetti squash like spaghetti. I don’t use oil–I just cut it in half, scoop out the seeds, place it cut-side down and give it a few stabs to make air vents. I don’t worry about salt and pepper because there’s usually enough in the sauce. Also it’s good if your sauce isn’t too runny. It is buffalo chicken spahetti squash. There are recipes readily available. Hot sauce, pieces of cooked chicken, green or regular onion, cut small. Some recipes add cheese and/or orcream cheese. I haven’t done much with spaghetti squash in a long time, but one of the things I found early on, was that if I cooked it too long, the flavor turned bitter. I allays roasted it whole, for 1.5 hours, turning it halfway through – for a medium squash (probably 2-3 pounds). My favorite way to serve it has always been as a side, with garlic butter and parmesan. Perfect timing! I happen to have a spaghetti squash on my counter which has been there forever because I’m never sure what to do with it. Good thing squash keeps a long time. 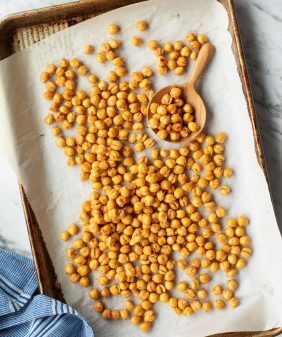 I can’t eat chickpea, but I will give it a try with kale as well. Good ideas. I would love to try all of these recipes. 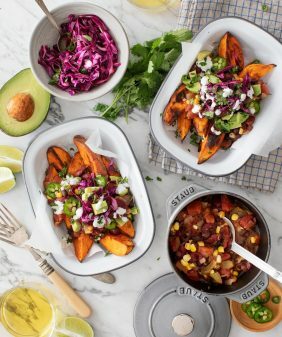 can the spaghetti squash be steamed in a instant pot? I find that if I cut the squash in the opposite direction than you did (around its “equator”, rather than pole to pole haha), the strands are longer and more spaghetti-like and twirl-able. I never knew you could roast it cut-side down, which is a great tip, stability-wise! It is so easy to follow! My daughter loves it, I mixed it with fried rice lol, and she didn’t notice there is veggies. 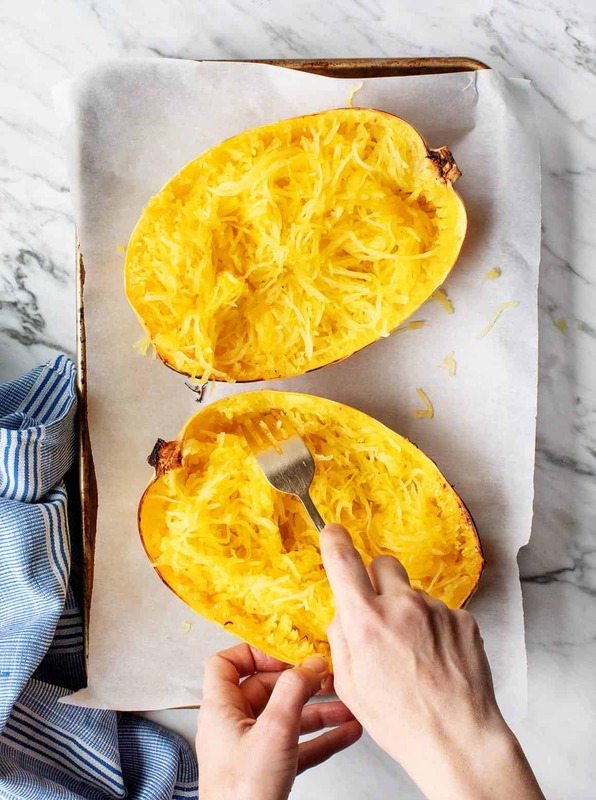 Is baking spaghetti squash in the oven a lot better than cooking it in a microwave? Hi Mary, I personally think it has a better flavor and texture when cooked in the oven. Loved it !! Also added garlic salt to mines yum!! Hi Jenelle, I’m so glad you loved the squash! Thank you for the recipe. It was fast, easy, and delicious! Thank you it has been a long time since I’ve cooked a spaghetti squash and I couldn’t remember if I placed it cut side down or up not to mention the amount of time to cook it. I’m making pork chops with apples & onions and I thought it would be great with it . Thank you for the reminder of how to cook it. Hi Tammy, I’m so happy this post was helpful! Thank you for the recipe an I cook the squash ahead of time? Hi Stephen, I’m so glad you loved the spaghetti squash! Came across this recipe by googling “cook spaghetti squash.” I roasted exactly as this recipe states, for 40 min. While it was cooling I chopped up all my leftover veggies (broccoli, asparagus, 2 leeks, and a handful of cherry tomatoes), mixed with olive oil. and put them under the broiler for 10 minutes. I mixed everything together after that and added salt and pepper. 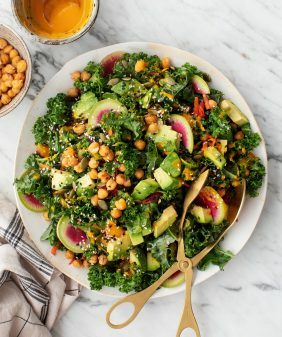 An amazing, healthy, vegan lunch for 2 with lots of leftovers! The al dente chew of the squash worked great in this dish. Thanks so much!